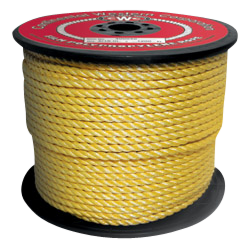 CWC's Yellow three strand film rope is a strong, lightweight polypropylene rope that floats and has excellent resistance to oil, marine growth and most common chemicals. Lacks the abrasion resistance of standard monofilament polypro Designed to not rot or deteriorate. Many put-ups available and ready to ship!